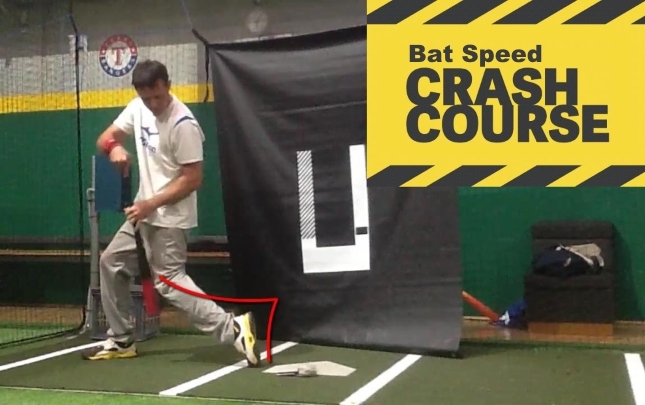 Anytime you step in for batting practice, soft toss, front toss, tee-work and other bat speed drills, it’s good you run a Bat Speed System Check for yourself, because the best way to improve bat speed is by teaching yourself. Just remember, hitting all comes from the lower half, from the core. The upper body that’s just along for the ride, a common mistake is to muscle up with your arms, that will just slow you down and you won’t product any bat speed. In order to gain bat speed, it’s important to start with a strong foundation, and to start off with that’s your batting stance, and that’s something you can easily check every time you step in the box. Make sure your back foot is a little bit closed in or at worse it’s straight, you don’t want to start with back foot open because it takes longer to rotate. I know some of you like to open up your stance, if you like to open up that’s fine, but the reason hitters generally open up is because they don’t trust their hands on the inside fastball. But, opening up doesn’t make you hit the inside pitch better. What’s going to help you hit the inside fastball is to keep the back elbow close to the body, alright? But I’ll go over that later. Step 1. Set up and step in a straight line. Step 2. Make sure that back foot is at least straight and preferably closed off a little bit. Step 3. Spread out in your stance. Step 4. Run the System Check again. I know some of you guys probably start with a narrow batting stance, but ideally what you want to do is start as close to that foot down position as possible (when that ball is in the air). Wherever you set up, you’ll end up at the foot down position. So it makes sense to start as close to “boom” foot down. We do that in order to minimize margin for error, you don’t want too many movement in your swing. When you start going up levels and face pitching with a bit of velocity, and if you have too much movement you will find yourself getting beat by the fastball. Check your feet! If you have a weak lower half, when you stride and you swing you’ll fall all over the place. Stride nice and straight, and check that you’re in a straight line, make sure your front foot is closed off as well. You don’t want to be setting up with an open front foot because the first movement is to open up, and when you open up, everything goes. The shoulder flies open and the head pulls off the ball. Make sure you get into a nice athletic stance, a little bend in your knees, you don’t want to be straight up. Slight bend in your knees, just so you’re in an athletic position, some young hitters will step in and get on their heels so when they swing, they fall off balance. Close that back foot off. Stride in a straight line. Close that front foot off. Get into an athletic balanced stance, one the inside balls of your feet, so you stay balanced. Once you’re in a strong stance, you’re ready to go onto the next stage. If you want a quick bat, you have to be nice and loose with your upper body, and then whip the bat through the zone. You don’t want to be hitting with too much tension. When your tense, it’s going to slow your swing down. Feet in a straight line. Athletic stance, and wherever you start your hands, just be nice and relaxed. Keep the upper body tension free. From here, the swing, when you want to talk about how to generate the swing, everything comes from the hips. Your swing doesn’t start from your back foot, your swing doesn’t start from your hands moving. Your baseball swing starts from your core. When you turn your hips, your hips turn your bat and rotate your back foot. 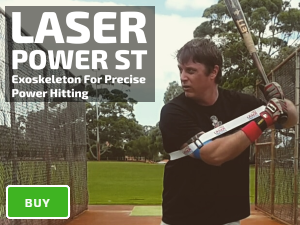 Basically, from a strong batting stance, you’re going to generate bat speed and power from your hips. Your hips are going to turn your back foot. Your hips are going to turn your top hand. Your elbow stays connected to your lower half by using your hips as the bridge.